Thanks to Chuck Wendig and his Terrible Minds blog for this writing prompt for a piece of flash fiction based on an image – for the full details and all the amazing pics go here. 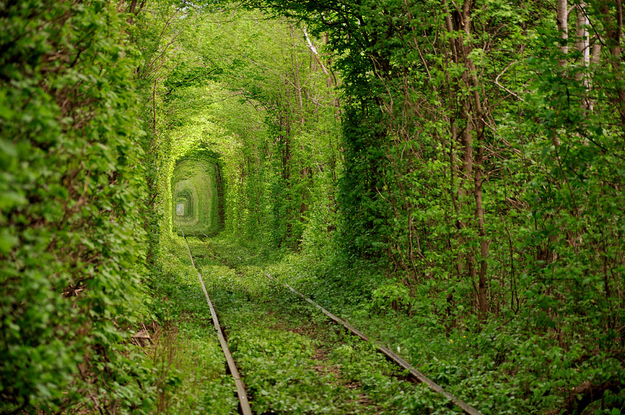 My piece is based on this amazing image ‘The Tunnel of Love’ which is in Kleven, Ukraine. You don’t leave it, you don’t stray from it – aren’t they always the rules when it comes to paths? That’s what I’d always thought, and yet here I was, with everything in my head and my heart telling me to do all of those things, to step off of the route ahead and to wander wider. The train had come to a halt in the early hours of the morning. It was a sleeper to London. I’d been away on business to Edinburgh and it made the most sense to use the time on the journey home to do exactly what the name suggested – to get some much needed shut-eye. But, at 4.45am, when I awoke to the stillness, the emptiness and the darkness of the carriage I regretted ever closing my eyelids. The small torch I carried on my keyring was sufficient for me to take a quick scam of my surroundings, enabling me to confirm that I was, most certainly alone, despite the fact that the carriage had been packed when we had left Edinburgh a few hours before. I’d pulled my backpack down from the overhead rack and had walked the length of the train, not passing a single soul and then, when I reached the driver’s cab and hammered on the door, received no response. But there was the chatter. All around me, I could hear the voices of the other passengers. To my ears only, the train was still packed with people, their voices, their conversations, the tinny rattle of their headphones and earpieces – and yet there was nobody to be seen and nobody responded when I called out to the voices. I’d pulled my mobile phone from my jacket pocket and checked the display – it was dead and blank. I only knew the time from my wristwatch – all the carriage displays were blank, must have gone off when the lights went out, when the train stopped, when I alone had noticed anything was wrong. For all of the voices everything seemed as normal for them. I’d called out again for a final time. Tried to interact with the voices nearest to me, a young family, but they didn’t respond, and neither did anyone who should be in the driver’s cab. It was, for all intents and purposes, a ghost train – something that gave me a wry smile despite the madness I felt closing in. The button seemed to be the only thing that still functioned on the train. I pushed the button at the door nearest the driver’s cab and the sound of it opening emitted as usual, the doors sliding open, the chill of the outside world rushing in. I’d stood there and waited a while, listening to the voices, waiting for someone to comment on the opening of the doors, of my soon to be exit from the train – nobody did, they just carried on with their inane chatter, oblivious to me and the world I was in. So that was when I jumped down from the train. Just as it was beginning to get lighter outside. I stood in the overgrown moss beside the train and looked up into the cab. It, like the rest of the train, was completely void of human life. I made to move my feet and was shocked at how wild the moss was grown at the trackside and, when I looked across, I saw that it was also right across the tracks, between them and the other side – it had grown so wild and free that it didn’t look like a train had passed on the tracks for quite some time. And then there were the walls, walls of trees to both sides of the tracks and, above, they met by bending to form a tunnel-like roof which stretched as far as the growing light allowed me to see. I scanned all around me, looking for movement, listening for sounds, but there were none. Just a long and silent tunnel of nature ahead of me, and the tracks my guide to the route ahead. As I began to walk, leaving the train and its voices behind me, the realisation hit me that, beyond the sound of my own blood echoing in my ears, nothing else seemed to be causing any noises, not the movement of my clothing as I walked, not my shoes on the undergrowth – everything had taken on silence. I reached into my jacket pocket, gripped my keychain and pulled them free, holding the collection of keys, metal keyring and torch out before me and then shook it. Nothing – not the slightest sound came. And yet, I walked, as though being steadily pushed forward by unseen hands at my back, further forward, deeper into the tunnel ahead and yet, with each turn, at each point where I thought it about to end, the tunnel continued onwards, onwards, forevermore.